Subscriptions. The Bulletin is distributed free to faculty, staff and students. Others may subscribe to the Bulletin for $30 for the 2006-07 academic year (half price for current Princeton parents and people over 65). Send a check to Office of Communications, Princeton University, 22 Chambers St., Suite 201, Princeton, NJ 08542. Deadlines. In general, the copy deadline for each issue is the Friday 10 days in advance of the Monday cover date. The deadline for the Bulletin that covers May 21-June 3 is Friday, May 11. A complete publication schedule is available at www.princeton.edu/ pr/ pwb/ deadlines.html; or by calling (609) 258-3601. Princeton NJ — For John McPhee, the most significant element of putting together one of his famed New Yorker magazine articles is figuring out the structure. “I’m obsessed with the structure of pieces of writing,” explained McPhee, the Pulitzer Prize-winning author and Princeton’s Ferris Professor of Journalism, who has taught his legendary class on writing at the University for more than 30 years. 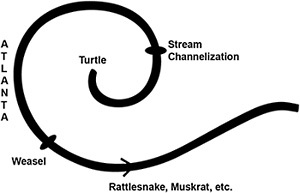 For his students, McPhee sketches primitive diagrams — a horizontal line with loops above and below it to represent the tangents along the storyline, a circle with lines shooting out of it that denote narrative pathways — to illustrate how a piece of writing is assembled. The “doodles,” as he calls them, are projected on a screen in front of the class. It makes sense that McPhee would seek to take apart, understand and explain a piece of writing, since he has sought to dissect and examine the nature of everything from oranges to airships in a 50-year career that has established him as arguably the most gifted nonfiction writer working today. In “Uncommon Carriers,” his latest book, McPhee explores the way the transportation of goods in the United States is structured — from the coal trains traveling through Nebraska and Kansas to the workings of the UPS hub in Louisville, Ky., from the 18-wheeler going cross country with a load of monoethanolomine to a towboat pushing a string of barges up the Illinois River. 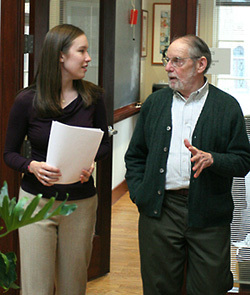 McPhee requires the same of the 16 students — all sophomores — in his “Creative Nonfiction” course, in which students discuss and practice the craft of writing through reading, listening to guest lecturers like New Yorker writers Ian Frazier and Mark Singer and, most critically, meeting one-on-one with McPhee for private conferences about their work. After McPhee marks up the students’ papers, he sits down with each student and goes over the writing line by line. McPhee’s comments were offered as suggestions, not directives, she said. “He started each conference by saying that I should think of him as an editor, but feel free to toss out his suggestions if I didn’t agree,” Wojcik said. McPhee’s class “changed my life,” said Jim Kelly, managing editor of Time Inc. and a member of the class of 1976. Kelly still has all the papers he wrote for McPhee’s class, marked up with his professor’s copious comments. One of McPhee’s most valuable lessons, Kelly said, was the curiosity he exhibited for all kinds of subjects. Other former students include David Remnick, now The New Yorker’s editor (“I’m proud of the fact that he’s turned down work of mine,” McPhee said); Richard Stengel, managing editor of Time Magazine; and Peter Hessler, The New Yorker’s China correspondent. Born and raised in Princeton, McPhee attended elementary school in the building at 185 Nassau St. that now houses Princeton’s programs in creative writing and other arts. His mother wasn’t happy with his decision to stay in town and matriculate at the University, where his father was an athletic team physician. “My mother said, ‘If you’re going to go to college right here in this town — if you insist on that — you’re going away for a year because you’re immature and you need to get out of here,’” McPhee recalled. After a year at Deerfield Academy in Massachusetts, he returned and graduated as a member of Princeton’s class of 1953. And except for a few years living in New York City and Cambridge, England, McPhee has defied his mother’s advice and remained in Princeton, using it as his home base as he has traveled around the world researching pieces for The New Yorker. Most of the topics he has explored in his writing, McPhee said, have roots in his childhood. “If you took a list of all the things I’ve ever written and put a check mark beside the ones relating to something I was interested in when I was in college or before, 90 percent would be checked,” he said. In the course of writing 27 books, McPhee has explored topics as diverse as cattle rustling in Nevada (“Irons in the Fire”), birch-bark canoes sewn and lashed by hand in New Hampshire (“The Survival of the Bark Canoe”) and the grooming of the lawns of Wimbledon (part of a collection titled “A Roomful of Hovings”). His sweeping work about the geology of North America, written in stages over 20 years and later collected in a single book called “Annals of the Former World,” won the Pulitzer Prize for general nonfiction in 1999. Much of the content of his books originally has appeared in The New Yorker. The first piece in his latest book, “Uncommon Carriers,” came about after McPhee received a letter from a truck driver named Don Ainsworth suggesting that McPhee come on the road with him. “I wrote him back and said, ‘Well, tell me what you do,’” said McPhee. They corresponded for five years, until McPhee decided to take a ride with Ainsworth, who typically doesn’t know his destination more than a day or two in advance. With a few hours’ notice, McPhee flew to Atlanta, took a taxi to a truck stop and became Ainsworth’s companion for a 3,190-mile ride from Atlanta to Tacoma. McPhee’s piece about the experience, “A Fleet of One,” portrays Ainsworth as the exacting captain of a 79,000-pound ship who studies and practices truck driving with the thoughtfulness and precision of an artisan. Ainsworth, for example, is so vain about his chemical tanker that he will only visit certain high-end truck washes where specially treated water and hand-brushing is used. The result? “You could part your hair in the side of his truck,” McPhee writes. In that piece and six others in the book, McPhee explains the intricacies of the fields of transportation he describes — from the lessons learned at a ship-handling school on a pond in the foothills of the French Alps to his ride in the cab of a coal train in Wyoming — with so much absorbing detail and precise explanation that the reader is inextricably drawn into these remote worlds. McPhee spent a long time contemplating the organization of “A Fleet of One,” finally settling on a chronological opening and conclusion, with non-chronological portions in between. When he had his students read it for class, he supplied them with the requisite doodle to demonstrate his thinking.